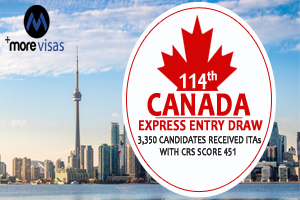 The least score of Comprehensive Ranking System edged down by a point to 451 as Canadian immigration officials conducted a latest Express Entry Draw. Invitations to Appeal were announced to 3,350 applicants in the draw, which conducted on Apr 3, 2019. The draw observed a rule of tie-breaking cut-off till Jan 9, 2019, at just prior to 3.35am EST. If higher than one applicant had the lowest score, the cut-off depends on the time and date they provided their profiles of Express Entry. Immigration, Refugees and Citizenship Canada was known as IRCC has now announced ITAs to 24,550 applicants in the year 2019, against the intake goal of 81,400 high-skilled candidate immigration. Immigration ministry of Canada broke the record for annual Express Entry ITAs in the year 2018 and achieved 89,800 ITAs. It was the seventh invitations round below the Federal Express Entry in 2019 and 114th overall. Canadian Express Entry System is an immigration system run by immigration authorities of Canada (IRCC) on Jan 01, 2015, which manages the skilled worker requests below the Canadian Economic programs. It includes the Canada Experience Class, the Federal Skilled Trades Program, the Federal Skilled Worker Program, and Canada Provincial Nomination Programs. Stakeholders presume to see roughly 30 draws and greater than 80,000 invitations declared in 2019, with a primary of the draws focusing CRS scores under 460 to allow immigration officials of Canada to satisfy and achieve the targeted yearly Canada immigration levels for 2019. Employers are advised to consider getting an LMIA or nomination beneath provincial nomination programs to secure long term employees holding. It is pretended that a bulk number of candidates to be announced I.T.As in the year 2019 will require a score of Comprehensive Ranking System well below 460 points, allowing a significant number of aspirants to receive PR to Canada without having a nomination or job offer below the provincial immigration program. However, securing a recognized job offer is highly suggested.